As the city’s leisure and travel promotions agency, New Orleans Tourism Marketing Corp. (NOTM) is responsible for a variety of efforts to attract travelers, families and other visitors to experience its unique culture. This includes an annual Fall campaign focusing on a New Orleans-style Christmas and a year-round festival campaign, among other initiatives. The 300th anniversary of New Orleans is a natural opportunity for residents and visitors to look back, but New Orleans Tourism Marketing Corporation (NOTMC) decided the city’s Tricentennial was also a great opportunity to use some very forward-looking technology to bring out some of the best stories. To make sure the whole world heard the call to tell those stories, Cision provided the perfect platform for the job. NOTMC pulled out all the stops for the city’s Tricentennial. This included a short film featuring jazz greats Lloyd Dillon and Johnny Vidacovich telling great stories to a crowd in Jackson Square as footage is fantastically projected onto the iconic Presbytère behind them. There were also seven national print ads featuring archival photography from the 1940’s to the 2000’s and, most significantly, a shipping container using IBM Watson artificial intelligence software that would listen for “audio triggers” from those who step inside to share their stories. These became film projections that could be recorded as beautiful, double-exposure videos. This is not a short-term activity, either. NOTMC will be launching a series of events and initiatives throughout the Tricentennial, so it needs to keep up the PR momentum all year long. 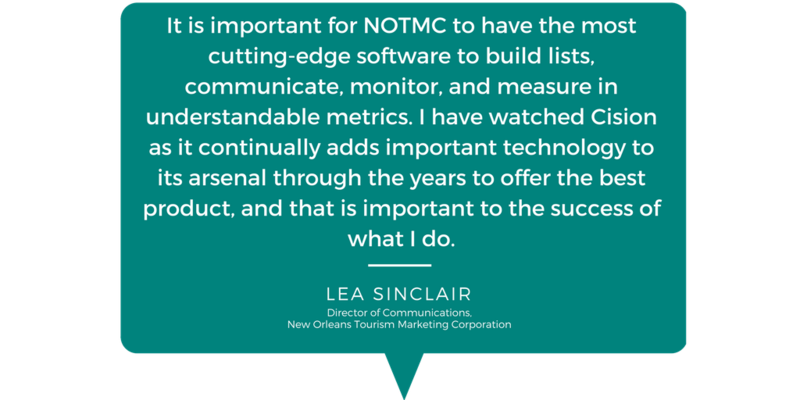 NOTMC is a longtime user of Cision Comms Cloud, which brings together database, analytics, and monitoring tools to successfully execute every aspect of an earned media strategy. Cision Comms Cloud includes Help A Reporter Out (HARO), editorial calendars from leading publications, the ability to bulk upload and schedule social posts, and more. Tailored and Targeted Media Outreach: NOTMC’s work spans areas that include art, music, food and wine, travel and other subjects. Some of these may be covered by a large, general interest magazine or newspaper, while others might be covered by a more focused, niche outlet. Real-Time Data: The pace at which NOTMC moves means Sinclair needs highly accurate and up-to-date information about the editors and reporters who might be interested in her stories. That’s why she says she appreciates the details in Cision Comms Cloud’s database on the current contact information of her influencers, as well as the ability to develop longer-term relationships with those who have given good coverage of the city’s tourism scene in the past. Board-Quality Numbers: Sinclair says she regularly has to give a breakdown of her results to the most senior leaders in the organization. Once again, she says Cision Comms Cloud delivers. Long-Term Trending: Sinclair admits she takes analytics one step further by archiving reports in a permanent Dropbox account in order to assess metrics in a more holistic and historical manner. As its Tricentennial celebrations continue, Sinclair knows Cision Comms Cloud will be a critical part of her own story as a communications professional.